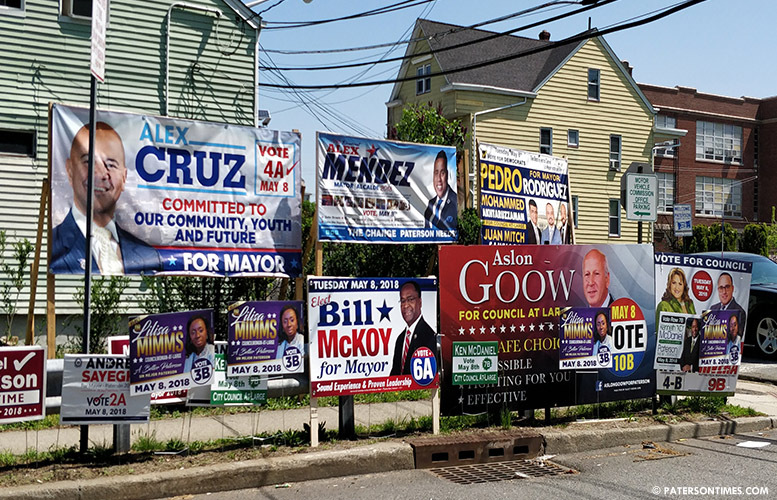 The city’s mayoral and at-large council election saw 6,072 mail-in ballots sent to voters, according to Passaic County records. 3,542 mail-in ballots have been returned as of late Monday. That’s 1,100 more than the total cast in 2014. Candidates Alex Mendez, Pedro Rodriguez, and Andre Sayegh have created units within their campaigns to encourage supporters, who would otherwise avoid going to the polls, to vote by mail. Passaic County election officials have tightened up the mail-in ballot application process to reduce the number of absentees, according to three of the six campaigns. “They have been scrutinizing them left and right,” said a person close to the Mendez campaign. “I think Andre will be in good shape as long as he can offset what the other candidates have done with mail-in ballots,” said Wayne Witherspoon, former campaign manager for ex-public safety director Glenn Brown. Brown dropped out of the race. Both the campaign manager and the candidates have endorsed Sayegh for mayor. Rodriguez, Mendez, and Sayegh each is expected to get more than 1,000 mail-in votes. Sayegh’s campaign joined the race for mail-in votes late in the game. “We know we’re going to be competitive in that area,” said Sayegh. His campaign is third in ranking on mail-in ballots, according to his opponents. He has a strong ground game that may allow him to close the gap. Councilman William McKoy’s campaigns joined the mail-in battle even later in the game. Mail-in votes constitute a 7th Ward in the city. In the 2014 mayoral election, 2,440 mail-in votes were cast, according to Passaic County election records. Some campaigns have reported shenanigans with mail-in ballots similar to those that occurred in the 2nd Ward in 2016. In some cases, people had their mail-in ballots picked up by campaign workers. In one case, a candidate went to a home and picked up mail-in ballots, according to the different mayoral candidates. The entire 6,072 may not materialize on election night. Rodriguez said usually 30-percent of the mail-in ballots are never returned. Rodriguez reckoned 500 more may be received on Election Day. “Normally, there’s not much that come in,” said Sayegh. Some have speculated the invisible 7th Ward may end up deciding who wins in the six men mayoral race. Other candidates in the race are Michael Jackson and Alex Cruz.